Capital S.M.A.R.T team member Justin Sheppard has been selected to represent Australia in Inline Hockey for this year's Oceania's Tournament to be held in New Zealand. Justin, who is part of the Operations team, has been picked for the Australian Masters Team to play against New Zealand, with the competition scheduled for 5-8 July in Hamilton NZ. 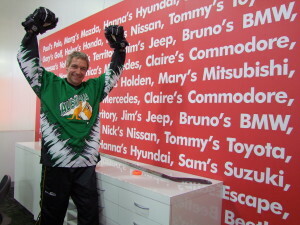 Justin has just returned to playing competitive Inline Hockey after an absence of about 3 years, during which time he played Ice Hockey as well as being involved in Inline Speed Skating. Justin has represented Australia on five other occasions at Oceania and World Championship events, playing in his first National Team in 1998 at the World Championships in Winnipeg, Canada. Capital S.M.A.R.T Chief Executive, Norman Moss congratulated Justin on his selection for the Oceania tournament. "At Capital S.M.A.R.T we celebrate the successes of all of our team members. For Justin to be part of a National team is a real achievement." said Mr Moss. Inline Hockey is played with a puck, on a concrete, wood or tiled surface, with teams of four skaters on the floor and one goaltender in the net. It is one of the fastest growing sports in the world. Players of all ability levels, children and adults, are drawn to the game because it's fast, it's competitive and above all, it's fun. Capital S.M.A.R.T has sponsored Justin for the Oceania tournament. S.M.A.R.T has a culture of encouraging and supporting team members involved in both competitive sport and activities which support the community, as part of its S.M.A.R.Ter For You program.